Bonnie and Sarah Gemmell are the mother-daughter team behind Spicer Bags. They are shown here in their manufacturing facility at the American Industrial Center in Dogpatch. Their new retail store is opening at street level in the complex. For many months we passed by the construction at the American Industrial Center (AIC) on 3rd Street and hoped that the new storefronts being carved out of the existing brick walls would bring more retail to 3rd Street. We enjoy the bars and restaurants in our vibrant neighborhood but boy it sure would be great to have a place where one could pick up a gift bag for that bottle of wine from Dogpatch Wineworks or a last minute birthday card or hostess gift. We already knew that the flaky goodies from Neighbor Bakehouse would finally have a permanent home in one of the four new spaces but we were excited to find that a current tenant of the AIC would be expanding into one of the storefronts and that this tenant would offer a line of retail products. Spicer Bags will officially open at 2341 3rd Street on Saturday, December 6 -- just in time for the annual Dogpatch Warehouse Sale. 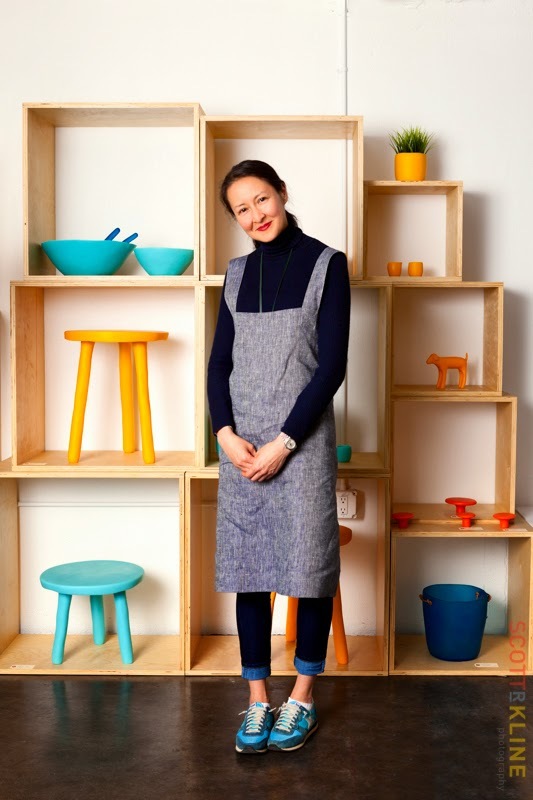 The new shop will be called Spicer on 3rd and will carry not only the company's line of totes and bags that have been long been cult favorites, but also a selection of curated items such as ceramics, furniture, gift bags and paper products. 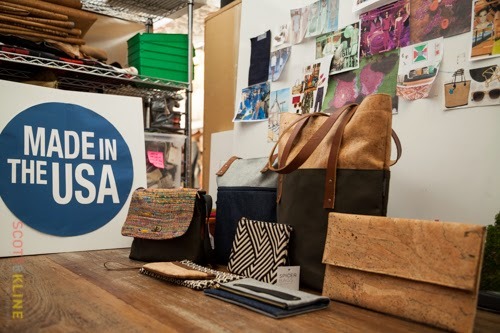 And like their bags, all the products are from companies that manufacture in the U.S. 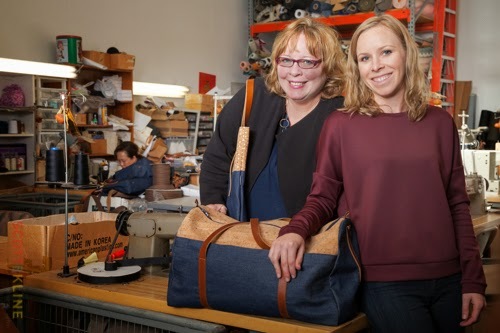 Although Spicer Bags has been around for more than 14 years, the shop on 3rd is a new beginning of sorts for the company and for the new owners, Bonnie and Sarah Gemmell, the mother and daughter who bought the company in 2013 from the founder and designer of the company -- the late Sally Spicer Rankine. Some of the products from Spicer Bags made from innovative materials like cork. All are made in the Dogpatch neighborhood in San Francisco, CA. We met with Bonnie and Sarah in their studio on the second floor of the AIC -- almost directly above their new storefront. In contrast to the yet to be filled storefront, their studio space was packed to the ceiling with textiles and manufacturing equipment. Sarah is the COO and is in charge of all operations and the constant trouble shooting that occurs in a small business with lots of moving pieces. Bonnie brings her many years of retail, catalog and small business expertise to Spicer Bags as the CEO. We both have a love of well-designed products. And we are long time entrepreneurs and supporters of products that are manufactured in the U.S. In 2012 we found out through a mutual friend of Sally Spicer that Sally was being forced to shut down Sally Spicer Bags because of her health issues. It made us so sad that after all her hard work she was facing the loss of her business and the legacy that she had been building for her son. We were amazed that with very little marketing effort she had build an incredible fan base for her bags. We were both looking for our next project and we weren't afraid of the challenge. We knew we had to buy the business to keep it going. We were ready to take on the challenge of not only keeping Sally Spicer Bags open for business, but also the challenge of expanding the core business and looking into new marketing opportunities. We had lots of marketing experience but absolutely no manufacturing experience! But we jumped in and although we kept the best sellers, we tightened the offerings and redesigned the bags where needed. We have assured our existing customers that if a favorite bag is no longer offered on our website, we can still make it for them if they request it. We also added a cork line that has a very modern feel to it. When customers started showing up at our manufacturing space requesting to buy the bags here, we realized we might have an opportunity to keep a retail space busy. We starting pestering the AIC folks about what might happen with the retail space they had been talking about building out. They agreed to build one out for us. We go to a lot of trade shows and had discovered some amazing people who were designing and manufacturing great products in the U.S. We always said if we had a retail space we already knew what products we would want to sell. We decided that the retail space would sell not only our bags, but also a curated selection of these products we had discovered. Some of the products we will have include easy to open water bottles manufactured from recycled aluminum cans from Liberty Bottleworks, a furniture company located in the Outer Richmond called Anzfer Farms, ceramics from Portland-based Pigeon Toe Ceramics and many more fun products including dog collars and leashes! We will now have two businesses that each have their own website -- Spicer Bags and Spicer on 3rd. We like that if all goes well we could possibly open other Spicer retail locations in other areas. We will continue to offer Spicer Bags through other retail outlets as well as through the Spicer Bags website. We have two employees and hope to add one more to staff Spicer on 3rd. Well, Spicer Bags was of course already manufacturing in the neighborhood when we bought the business. And the two employees who worked with Sally stayed with us and were comfortable with the neighborhood. We didn't see any need to make a location change. And we loved the vibe of the neighborhood. It felt like so much was happening here and was only going to get busier. We are always discovering something new. We want to be part of that growth. Bonnie -- I would be an organic farmer! I grew up on a farm in Ohio and I love my tomatoes! Sarah -- as the "nerd" in the family I've always been drawn towards product technology -- the user interface design part. I would probably be working in a technology company that was developing the next great App! Bonnie and Sarah: "and this is why we work well together"! Dogpatch resident and SF City Attorney Dennis Herrera stands in front of the former Bethlehem Steel Administration building. The building is part of Dennis' home neighborhood and the center of the Pier 70 development coming soon. San Francisco City Attorney Dennis Herrera is on the short list of Dogpatch residents who could be considered an unofficial mayor of the neighborhood. He is also known not only in San Francisco, but also nationally for the efforts of his office to advance civil rights and affirmative litigation -- the high profile fight for the Case Against Proposition 8 being only one example. He is also in the forefront of legal efforts to protect consumers. But in Dogpatch he is known as that guy in shorts and a SF Giants baseball hat who can tell great stories and is also quick with a joke and who turns up to support numerous neighborhood events such as the opening of the new playground or restaurant. Given the busy nature of his job as City Attorney for the City and County of San Francisco, it is not surprising that it took us almost three years to catch up with him to chat. I love being involved in issues that make a difference to people in the community and in the state. And since I'm independently elected -- only one of ten in the state has this status, the rest are appointed -- I have tremendous independence when I get involved in an issue. I can get involved in any issue from local to national. I grew up in New York -- on Long Island -- where I did a lot of fishing. I pursued an expertise in maritime law because it allowed me to combine my love of international law and fishing -- the love of law and water! While I was in law school in Washington, D.C. I read an article about rock fishing in San Francisco. I needed a summer job so my best friend and I came to San Francisco during Thanksgiving week and slid our resumes under doors at various law firms around town. I actually got hired by one of those law firms. The internship was during the summer of 1987 and it was the 50th anniversary of the Golden Gate Bridge -- I will never forget that -- it made a huge impression on me as did this city. The law firm gave me an offer after law school and here I am! San Francisco City Attorney Dennis Herrera has lived in Dogpatch since 1993. In 1993 I was single and was living in a great place near Coit Tower. I saw a real estate ad featuring a Victorian home for sale in Potrero Hill. I told my real estate agent I wanted to look at it. It was of course actually in Dogpatch, not Potrero Hill but real estate agents at that time didn't think anyone would know where Dogpatch was. The Victorian was built in 1884 and was surrounded by the Hells Angels clubhouse, empty lots and was accessed by a dirt road which real estate agents call "an unimproved road!" It was a neighborhood that was almost in hibernation because at that time there weren't that many places for residents to gather. But it was affordable and I loved the sunny weather. I looked at it once and told my agent to make an offer which she was very surprised about. I have actually lived in the neighborhood longer than Susan Eslick! Right before I closed on the house I received an offer to work in the Clinton Administration. The offer really made me stop and think if I wanted to be in SF or D.C. long term. I knew others who had gone to D.C. for supposedly a short period of time but ended up staying permanently if they stayed longer than two years. I offered my girlfriend the house to live in while I was gone -- I would come back every six weeks. She agreed and I did this for 2.5 years. Over time the limitations of the geography of the area contributed to making it feel like a real neighborhood. I think the sense of community comes from having those boundaries. I like that not only are the residents activists but so are the local businesses. What would you be doing if you weren't a lawyer? I would be a fishing boat captain or drive a cab. When you campaign as I did for Mayor of San Francisco, you really get to know your way around the city. Tina Frey at the Tina Frey Designs showroom and studio in Dogpatch, San Francisco, CA. We had lived in Dogpatch almost three years before we stumbled upon the lovely and practically microscopic park on the short stub of Minnesota Street between 23rd and 24th Streets. We were also amazed to see several shops on that same stretch. We previously thought these were only home to renovation warehouses and the ever tempting popcorn warehouse. Alas, the shop window we pressed our noses against, Tina Frey Designs: Modern Designs in Resin, was not open to the general public. Until now. Now the colorful resin bowls, cake plates, trays, furniture, jewelry and so much more that were just out of our reach are now available for purchase direct from the Tina Frey showroom. Although her designs had previously been available for sale via her website as well as through various retail locations such as Barneys, SFMOMA and the De Young Museum, her showroom on Minnesota is the only place to find her entire collection. The ground floor is a study in controlled chaos with the products being ready to be wrapped and boxed then shipped to their new homes. In marked contrast, the product showroom up an open staircase was a burst of color and extremely organized. Zoe -- one of Tina Frey's dogs, announced our arrival from the top of the stairs with a friendly bark. Upstairs, our eyes feasted on the colorful designs as well as the soothing gray, white and black designs displayed against neutral backdrops. A sense of playfulness infuses many of the items including the wonder woman cuff bracelets and the domes and covered dishes with bunny ears for handles that we discovered were inspired by owner Tina Frey's childhood bunnies -- fluffy and puffy. One long table held an unfinished red-clay colored bowl; a work in progress. Adjacent to the second floor showroom was a studio workspace for Frey and her three full-time and two part-time employees. 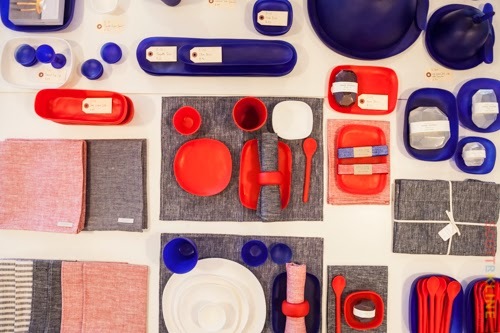 Tableware at Tina Frey Designs in Dogpatch, San Francisco, CA. It is so rewarding and even emotional for me to see a vision I have for a design take shape and become an actual product. But my parents encouraged me to pursue a profession that would support me financially. Being an artist and working in all types of mediums was always just something that was a part of my identity and came easy to me but I didn't consider it as a career path. I was born in Hong Kong but grew up in Canada. I majored in biology and chemistry but a summer job measuring the fat content in foods at a major grocery store chain convinced me to get an additional degree in accounting. I worked at Ernest & Young in Canada then a job in managed health care brought me to San Francisco in 1997. Eventually I decided to pursue a finance job in an industry that actually interested me so I joined Louis Vuitton Moet Hennessy (LVMH) which is an umbrella group for many prestigious luxury brands. I eventually moved to New York City with that company and then to Guam. One night I found myself in a Walmart in Guam buying roach traps for my apartment when I decided that while Guam was a lovely country, it was too small for me and I decided to first return to San Francisco and then make a move to London to look for a new job. That was on September 9, 2001. When 9/11 happened I couldn't get a flight out so I decided to stay in San Francisco. I worked in finance for several local companies including Levi Strauss, The Gap and Red Envelope. In 2007 I was working at a retail start up that was acquired when after encouragement from my husband, I decided to take some time off and really evaluate what I wanted to do next. Through my various jobs in finance I had never stopped being an artist. At the time I started thinking about my next career move, I had been reading books on using resin in sculpting. I knew I was going to make design my new career although I didn't know what products I would design. In fact, I designed my logo -- a rabbit inspired by the rabbits I kept as a child -- and came up with the name Tina Frey Designs before I knew what my first product would be. And I knew my designs would be modern yet organic which to me means clean and simple but not perfect. I design and hand sculpt each piece here in my studio. Once I finalize a design, molds are fabricated and then the designs are individually cast and sanded by hand. One of the first things I did when I started my design firm was to find craftsmen in China to make the molds and the products for me. In July 2007 I exhibited at the San Francisco Gift Show. It was hilarious -- I was surrounded by vendors exhibiting a wide assortment of products and I only had two styles of bowls in four colors. I didn't even know how to take an order. But I did sell product that day and in fact met the buyers from SFMOMA who still carry my products. I get my design ideas from my travels, magazines, blogs -- I never lack for ideas -- my head is always full of ideas and images. Even though there was interest in my products and I was selling to the trade, wholesale and eventually direct from my website, I still worked part time in finance for a messenger bag company called Timbuk2. I funded my design business that way and slowly cut back my time there until I was certain my design business was self-sustaining. Initially I worked out of my house -- products were everywhere. I had a small studio in Activspace in the Mission then moved to a studio in Potrero hill in 2012. When I outgrew that space the landlord, who also owned this building, suggested I take a look here. I already knew about the neighborhood through Mark Dwight of Rickshaw Bagworks whom I met through Timbuktu. I think there are so many undiscovered people doing so many interesting things in this neighborhood. Note: Tina Frey Designs is located at 1278 Minnesota Street and is open Monday-Friday 9 am-5 pm and Saturday noon-5 pm. Bruce Huie with the gears that were used to run the old Third-Street line that preceeded the T-Line. 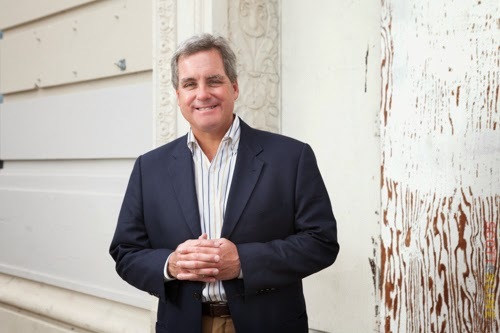 If you want to know the status of any development project in Dogpatch, ask Bruce Huie. 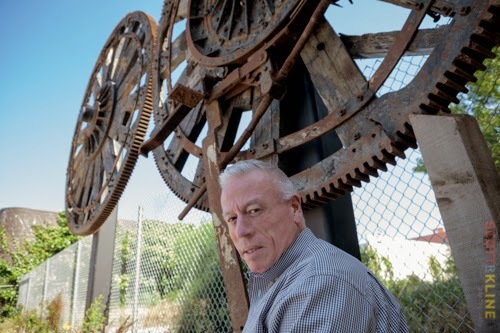 If you have an idea for something that would benefit your Dogpatch neighbors, ask Bruce Huie. If you work for the city and see Bruce Huie at your door, do yourself a favor and just say yes to whatever he wants because in the end he will find a way to get it done. Bruce Huie is more than just a resident of Dogpatch, he is a neighborhood activist and resource. The man never stops thinking about how to improve the neighborhood to make it safer and more walkable. Dogpatch has an embarrassment of riches when it comes to great restaurants and bars but we also have an ever increasing wealth of open spaces to enjoy thanks to the work of residents like Huie. To have fun and to meet people but also because I want to be a resource to my community. I want to give back and feel like I have made a difference in this world. I grew up in Boston and after school in D.C. where I got a degree in economics I headed to USC to pursue a masters in communications technology. I work in demand generation -- I make sure a company's marketing programs help them accomplish their sales goals. A friend from the Bay Area asked me to help him on a project so I moved here in 1987. My first neighborhood project became Progress Park. We all have beautiful homes here and it would be easy to never leave those homes but if we do that we never have a chance to connect with each other. A group of us that lived near the run down lot owned by Caltrain on Indiana Street between 23rd and 24th started wondering if it could become a park that would serve the neighborhood. We approached the city about the project and of course the idea was met with resistance but every time someone said no we said, "why not?" We tried to speak to them in terms of how it would benefit them. The city told us it would take five years and half a million dollars to get the park done but it took us two years and $100,000. After that we became known as the get it done folks. 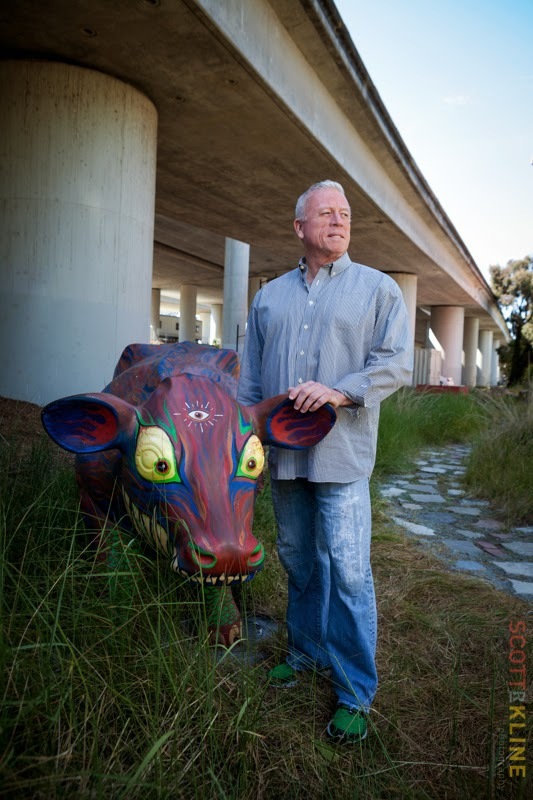 Bruce Huie, Dogpatch activist and a founder of Progress Park, poses with a cow sculpture that is one of the centerpieces of the park. The walkway across from the Muni yard on 23rd was also an area that was in desperate need of an upgrade. The spark to get something done happened when I saw a pregnant woman have to walk in the busy street because there wasn't a sidewalk on that side of the street. We have now put in a walkway and beautiful plants there. It was also the best spot for the Gears which became an art installation above the walkway. The massive steel and wood gears were uncovered at the Millworks construction site on Indiana Street. The gears were used as part of the transportation system to move supplies through this area in the 19th century. The gears were stored for about a year before we figured out the best spot for them. Another project that is just getting underway is the Dogpatch Playground project at Minnesota and 22nd Street at Woods Park. Dogpatch is the only neighborhood in San Francisco without a playground. And the need for one shows how much our neighborhood is changing. One of the things I loved about this project is that when we held a fundraiser for this project at Piccino Restaurant, I didn't know 90% of the people who showed up! We break ground May 16. It's great to have all these new open spaces for the neighborhood but they obviously require a lot of upkeep and maintenance. That's why I'm working with a group to form a Green Benefits District for Dogpatch and Potrero Hill property owners. If approved, property owners would pay a tax to pay for the upkeep of open spaces in our neighborhoods. This wouldn't take the place of funds from the city but instead would enhance the baseline services that the city provides. I like that I get to use wo of my top strengths in all these projects -- I'm very persistent and I'm entrepreneurial. At the request of the mayor's office, I'm also serving on the citizen action committee which advises the city on neighborhood issues. When I first moved to San Francisco I lived in Dolores Heights and then on 10th Street. But I was working in Palo Alto and I really wanted a place by the train station to make my commute easier. I was outbid on a place in SOMA but then I heard that there was a place to catch the train in a neighborhood called Dogpatch. At the time that I bought my place at 23rd and Indiana it wasn't considered Dogpatch -- 22nd Street was the outer boundary. We called ourselves Baja Dogpatch! We went before the Dogpatch Neighborhood Association to request that the historic district boundary be moved to Cesar Chavez and they agreed. Dogpatch feels like the stereotypical small town. We may have loud conversations but they are all thoughtful conversations and we respect each other. Photographer Rodger Hostetler of Lot21 stands in back of the fine art photo gallery in his space in Dogpatch, San Francisco, CA. The large commercial space in the Esprit complex had long been vacant. From time to time there would be rumblings of possible tenants -- there was much excitement for a few minutes when a grocery store was rumored to be interested but years slipped by without any signs of life at the corners of 20th and Indiana/Minnesota. Then the universal sign of something might be happening occurred -- brown kraft paper covering the windows was taped up and construction no parking signs were posted. We then heard that a photo studio and a sushi restaurant were going to take the space. 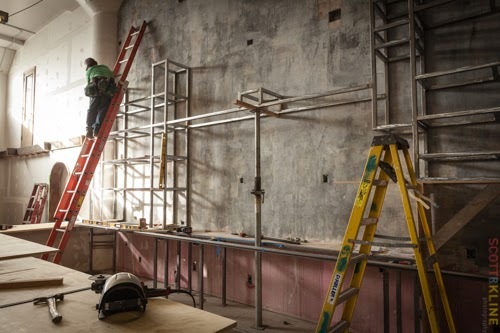 Even for San Francisco that sounded like an unlikely combination and when we saw a new interior wall being constructed we understood that the space was being divided into two businesses. The sushi restaurant space at 20th and Minnesota hasn't had much activity in the last few months and the paper covering the windows is now drooping sadly making us wonder if disappointment might be on that corner instead of California rolls. But the larger of the two spaces at 20th and Indiana is now the beautiful new home of Lot21 Gallery and Studio -- a 5800 square foot commercial photography space with 1500 square feet dedicated to a fine art photography gallery open to the public. Because it much of the space is a photo studio, window coverings are typically drawn over the windows giving the overall impression that the gallery isn't open but once you are inside the space you realize that the muted light is necessary in order to enjoy the photo exhibit. Beyond the gallery space is the studio for executive director and photographer Rodger Hostetler. Hostetler does both studio and location photography work for such clients as HP, Old Navy, Paypal as well as smaller clients such as Lunar Design. His sole employee, Sara Chestnutt-Fry, curates and manages the gallery. Hostetler sat down with us soon after their February opening to explain his journey from Southern California surfer to successful photographer and gallery owner. Studio Space at Lot21 in Dogpatch. The stairs lead up to the kitchen, meeting area and customer lounge. Photography has been my life for more than 18 years -- I can't imagine doing anything else that would allow me to be creative and to also make a living for my family. I grew up in Southern California and when I was a teenager I moved to Monterey. I loved surfing so I moved to San Diego. I became an art director and worked for a surfing publication as well as for Haro Design. It was a good life but I knew at some point I would have to move to Los Angeles or New York City to advance in that career and I didn't want to live in either of those places. So I changed directions a bit and started assisting on photo shoots. 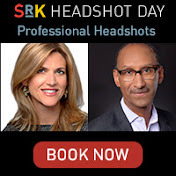 I did that for many years in many cities and although I did take a lot of workshops I really learned on the job. It was hard to be an assistant after being in charge as an art director but I learned a lot. In 2001 I made a connection with The Gap so I moved to San Francisco to freelance for them. Now I primarily focus on product shoots for large and small corporate clients. One of the things my clients like about my work is my ability to shoot ordinary objects -- like an ice cream scoop from Lunar Designs for example, in a different way. I don't cram lots of objects into a small space like a lot of photographers do. I like to use a lot of space in my shoots. That's why the size of our new space works so well for us. I can build a set in this space and still have the ability to walk around it. Like a movie set, this space can be configured in many different ways -- like a house or an office -- and still have room for the photography equipment. The large space allows us to shoot like we are on location. On the mezzanine level we have a big kitchen that can be used for food photography and we also have a room with a large dining room as well as a living/rec room space. The gallery gives us another source of income but more importantly it gives unknown artists a chance to show their work and for some of them -- show their work for the first time. All the work is for sale and we primarily look for work by photographers who are building some momentum for their work and are from the contemporary photography world. Rodger Hostetler discusses his new photography studio and gallery in Dogpatch, San Francisco, CA. I lived in Dogpatch when Just For You Cafe was the only place to eat in the neighborhood! Sometimes the cooks there would even let my kids make there own pancakes. Then Serpentine opened and the neighborhood just got better and better from that point in terms of more great places to eat but it still felt like it kept its unique character. So I definitely knew the neighborhood even thought I've now lived in Noe Valley for about nine years. When we decided we wanted a large space that could be both a studio and a gallery we first looked in Bayview but the space we wanted didn't work out -- it needed too much work. This space was a bit bigger than we wanted but we liked that it was totally unfinished -- no electrical, plumbing, zip -- so that we could finish it out to totally suit our needs and the building management worked with us to make it happen. My commercial clients and gallery visitors love how easy it is to access this location and parking is generally pretty easy and will become easier now that we have daytime access to the parking spaces in front of our building. I'm a big outdoor adventure person so I would probably live in Tahoe and mountain bike, ski and snowboard. Maybe head to the ocean to surf a bit. Actually, I'd probably be the old guy at some high-end resort giving skiing lessons! And the name -- Lot21 -- where did that come from? We wanted a name that had some history to it and also sounded industrial. Lot 21 is the lot this building was on before it was divided up to be developed -- it was ACME Paint before it became the Esprit headquarters. Brett Eisenberg, CEO of Triple Aught Design (TAD), does not want anyone to think that TAD is defined by him or by any one individual. He is adamant that the success of the company is because of their amazing team and the products they offer. 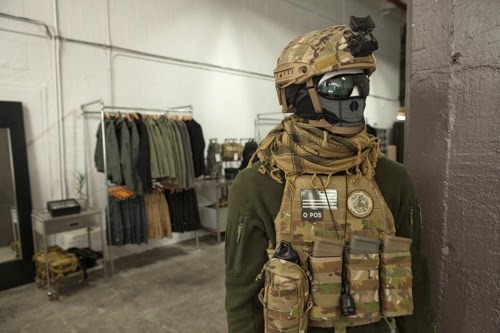 Even the clothes he wore the day we met with him blended in with the sea of camouflage and khaki clothes that surrounded him in the TAD retail space on 22nd Street at Third. It's true that for many years after Patrick Ma founded TAD in 1997 the image of the company and the founder were indistinguishable. In the early years the mission of TAD was to curate high-end third party products and it built its early reputation and a cult customer following on custom knives and other third party products followed. Its first clothing product was introduced in 2000 - a soft shell explorer jacket. Today the company sells its outdoor gear and apparel direct to customers through its Dogpatch and Hayes Valley retail locations. Over the last few years TAD has transitioned from a non-manufacturing company offering only third party products to a manufacturing company that controls every single aspect of the products it offers. Although Patrick Ma left the company in 2013, TAD continues to build upon its earlier success to become one of the largest producers of apparel in the Bay Area. The company recently completed a remodel of its Dogpatch headquarters and has now grown to 30 employees. 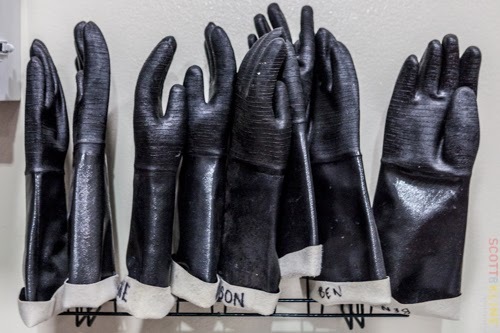 All design, pattern making, prototyping, production management and fulfillment of products take place in Dogpatch with the actual manufacturing occurring in Oakland. 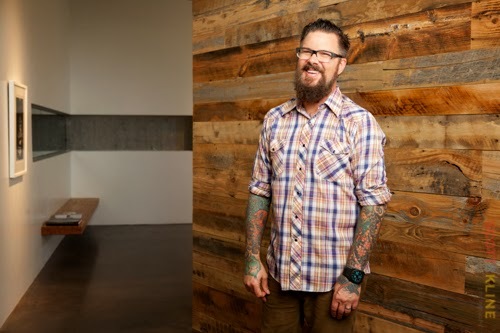 The company still offers non-apparel products like those custom knives but those items are now co branded with TAD to ensure they meet the company's standards. 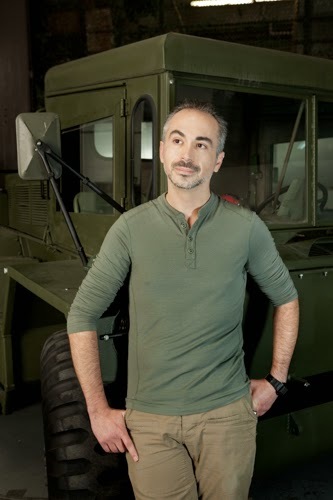 Brett Eisenberg, CEO of Triple Aught Design at the company HQ in San Francisco's Dogpatch Neighborhood. I was a customer of TAD since its early days. I grew up in Colorado and was always an outdoor adventure guy so I loved and used their products. I wanted to be in technology so I eventually moved to California. I spent most of the 1990s primarily as an engineer helping technology and biotech companies reach their potential. Although I enjoyed that business I really wanted to be in a business where I could be involved in all aspects of the life cycle of a product -- I wanted to actually be able to touch the product. That became harder and harder to do in the technology world where so many products are produced overseas. I felt like I had an opportunity to do that with TAD -- to be involved with all aspects of the product and I joined the company in 2009. I really felt like I could see what the company could become. We effectively relaunched the company September 1, 2010 rebranding as a manufacturing company selling direct to customers. The original location of TAD was in Jack London Square in Oakland. 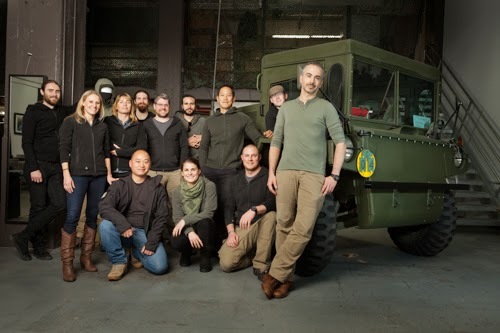 In 2004 the company moved to Dogpatch. We love the industrial, very hands-on feeling of the area -- we feel like it mirrors what we are doing and we really feel like we fit in here. We have a great support network in this community. 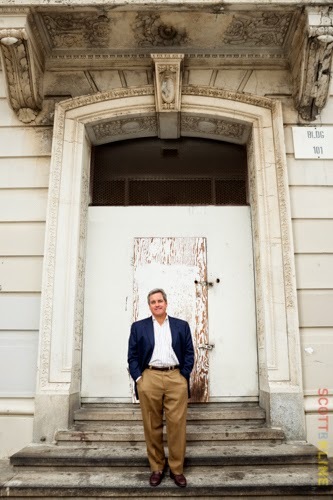 The landlord of this building, Greg Markoulis, and his team have gone out of their way to help us grow and be able to stay in the American Industrial Center. They have really been a partner in our growth. 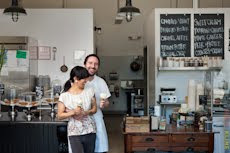 We love the feel of the small community in Dogpatch. The same folks we see when we are out having lunch are the customers we see in our shop. What is the story behind the name Triple Aught Design? Engineers use 000 (triple aught) as shorthand for a thousandth of an inch, which is the high standard of precision tolerance. We apply those same high standards and attention to detail to our products. The name was later changed to TAD Gear but we changed it back to Triple Aught Design in 2010 when we decided to relaunch the company as a product company and not a curator of third party products. We felt it truly reflected our new mission. A mannequin stands gurad at Triple Aught Designs in San Francisco. TAD features precise designs made to military precision in the Dogpatch Store. 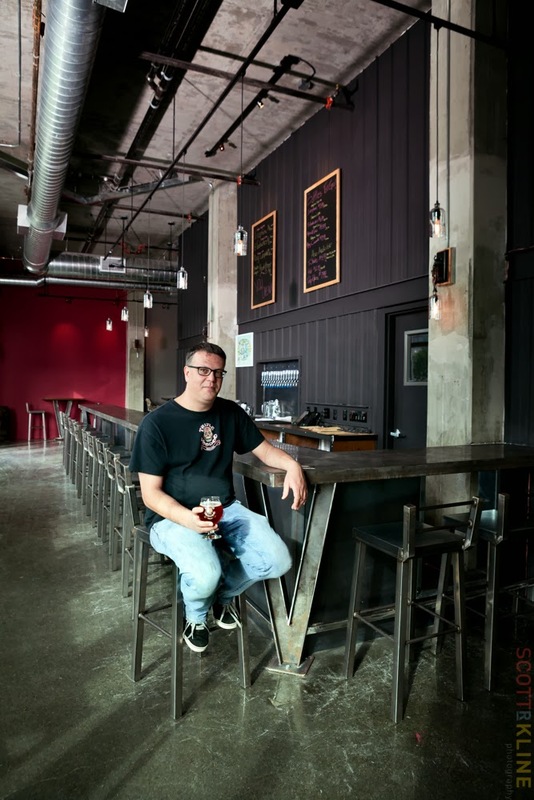 Greg Kitchen at the bar in Dogpatch's new brewery, Triple Voodoo. Dogpatch is quickly being brewpatch with the addition of Triple Voodoo Brewery and Taproom between 19th and 20th at Third in a ground floor location in the new Potrero Launch apartment complex. No complaints here as co-owner Greg Kitchen-- or as he describes himself -- "CEO, COO and everything else," lined up four of their craft brews for us to taste. 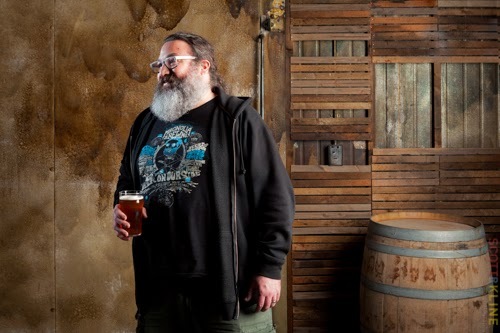 We thought Kitchen might enjoy actually getting to sit down given his hectic schedule of not only moving into their first brick and mortar location, but also overseeing the SF Beer Week activities that were in full swing the day we visited. But Kitchen remained standing as he described the beers we were tasting, talked to a new employee, looked at the schedule for that evenings activities and talked excitedly about the strains of yeast they use that give their brews such unique characteristics. Perhaps there was a bit of black magic going on or maybe Kitchen was super energized by finally having a home for his three year old company but it was obvious there would be no rest for him in his immediate future. I want to wake up each morning and know I'm going to work at something I love. And I love the community and the culture of the beer brewing world. I grew up in California and I have a computer science degree. I worked in the technology world for about 15 years. But I loved brewing beer and so did my friend Aaron Chan and we became avid home brewers. It isn't legal to sell home brewed beer so we gave it away at parties for several years. More and more people started asking us for the beer and once we realized we were giving the beer away to more than 200 people we knew we might actually have a business. We did a lot of soul searching as well as creative financing and started our craft brew business in 2011. Our goal was to take the best aspects of the Belgian and California styles of brewing to create our own unique beer style. While we certainly appreciated other brewers letting us use their space, it is hard to be a gypsy brewer. 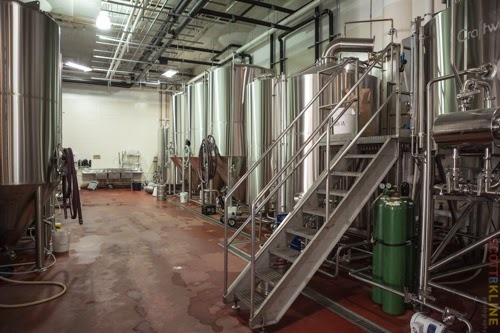 You never really get to know the equipment as well as you would like and you have to adhere to their brewing schedules. So we are excited to finally have our own space. We have a 10 barrel brewing system here and most of the beer we produce will be used in our own taproom although we have our wholesale, retail and collaboration projects that we will supply with our beer as well. We want to create an interesting and varied tasting experience for our customers so we plan to have rotating taps featuring new styles every month. 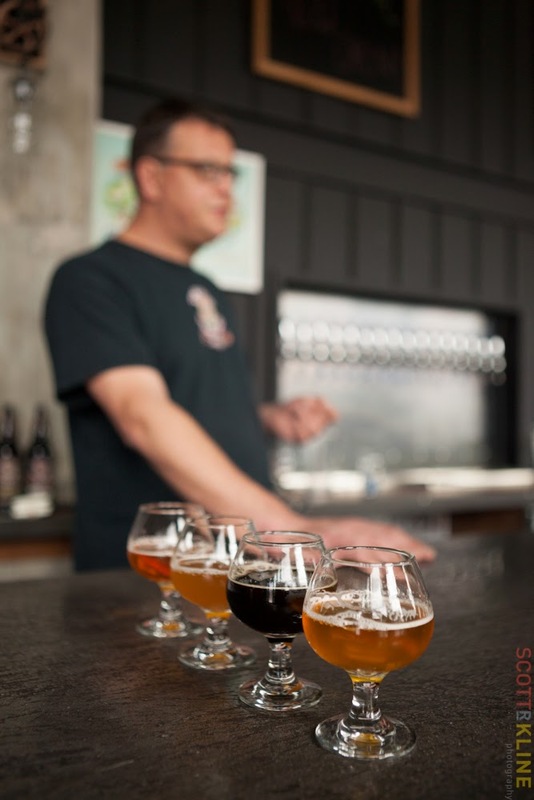 We plan to offer tours and sessions with our head brewer, Phil Meeker, to educate folks on craft beer and on the brewing process. We don't have a kitchen but we plan to partner with various restaurants and food trucks to provide food for customers. Right now, we are working with The New Spot, a Mexican restaurant that is a local favorite. We always had the goal to have our own space. 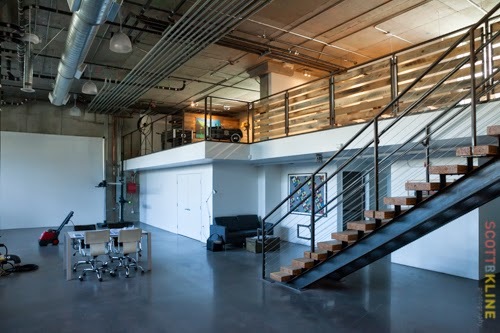 We love the vibe in Dogpatch -- we call it modern industrial. It suits us. We looked all over San Francisco for the right sized space. It was hard to find a space that was under 3000 square feet. We really wanted an artisan-sized brewery and tap room. We have about 2800 square feet here. And we used local artisans whenever possible to finish out the space. In fact, I was having a burger at Serpentine one day and sat next to a guy who I eventually hired to do our bar counter. What's the story behind the name -- Triple Voodoo? Originally the name was Cherry Voodoo. We thought is sounded cool but people thought we made cherry beer so we knew we had to change it. We came up with the name Voodoo to represent the science of brewing -- take simple ingredients but produce these complex flavors. And triple because at the time there were three partners. So, Triple Voodoo! 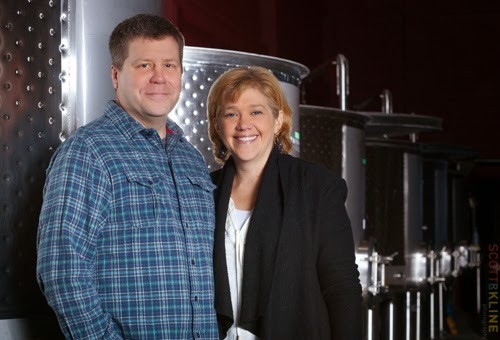 John and Katie Fones of Cellars33 at their Dogpatch Winery. Freshly baked bread and popcorn. These were the smells that greeted us as we entered Cellars33, a winery located on Minnesota Street. We expected the smell of yeast but popcorn? But perhaps that comes with the territory when you open a winery in an urban environment and your neighbor is Thatcher's Gourmet Popcorn. Inside the 20,000 square foot facility we were greeted by owners -- and husband and wife -- Katie and John Fones. 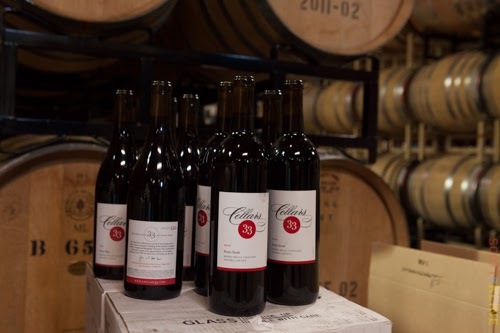 Cellars33 shares the space with four other wineries: Roar Wines, Von Holt Wines and August West Wine with John Fones the winemaker for his Cellars33 as well as Von Holt Wines. Despite the harvest season being over, the huge space was buzzing with activity as the wineries completed off-season housekeeping chores as well as prepared to fill upcoming holiday orders. 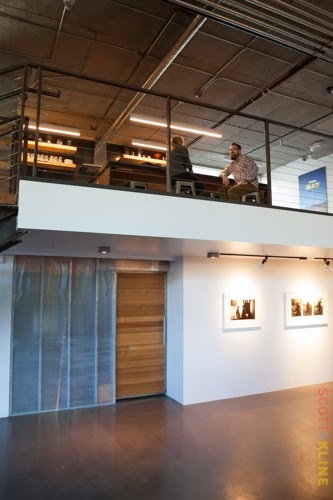 The move from their former location in Bayview to Dogpatch was completed in September 2012 but with rows of tanks and wine barrels consuming all available space it made us wonder if additional space might be needed soon. Love of life. For 16 years I was a criminal defense attorney in Baltimore, where I grew up. About eight years ago several good friends passed away. Then my mentor passed away as he walked up the courthouse steps. I realized that time is short. You always think you have tomorrow but that's not true. Katie and I have always loved wine and we had a lot of friends in California who we thought could help us make the transition. We owe a big debt to them. So we decided to move to California. I studied wine making at UC Davis and interned at Freeman Winery. I then became an assistant at Roar and August West. The goal was always to start our own label which we did in 2008 although we didn't begin selling our wine until 2010. Although I'm the primary wine maker, Katie has an excellent palate and her input during the blending trials is critical in helping us decide which wines to focus on. We primarily focus on Pinot Noir and Chardonnay -- our grapes are from Monterey and Sonoma. We started with 100 cases in 2010 and are now at 1,000 cases. We primarily sell via our mail list although we are not a wine club. We offer the wine two times a year in February and August then sell the rest to wine shops and restaurants. We love working together. And we didn't change our lives and move all the way to California to not see each other! This is a very fun, cool joint venture and even though I'm still practicing family law, my goal is to eventually work full-time with John. In addition to their specialty Chardonnays and Pinot Noirs, Cellars33 also produced this 2010 Petite Syrah. We love the vibe of Dogpatch -- fun things are happening here and we want to be part of it. Finding a space big enough for a venture this big was of course critical and Dogpatch is one of the few places left in SF that not only has the space, but also affordable space. We are a member of SFMade and this organization has helped us so much. They give us access to resources that we don't have such as real estate expertise. For example, we would love to open a tasting room in 2014 and SFMade is helping us figure out how and where we could do this. We would love for it to be in Dogpatch. There is no other alternative to this. We came out here to do this -- we didn't come out here to fail. I agree and my goal is to be full-time at Cellars33. Why did you name the winery Cellars33? The name Cellars33 is a nod to Baltimore and to our heritage. 33rd Street was where the old Memorial Stadium was located which was also sometimes called the world's largest outdoor insane asylum.